Are you experiencing the affects of grief and loss? 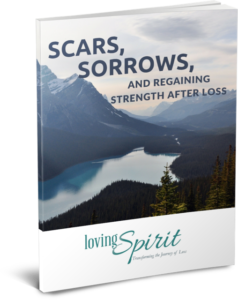 Download this FREE resource Scars, Sorrows, and Regaining Strength after Loss and begin to return to a space of hope and healing. At Loving Spirit, our ultimate goal is to change the way we think about, prepare for, and respond to death and loss. That, in a nutshell is what transforming the journey of loss is all about. Can we begin to see that death does not render us powerless and can we begin to recover sooner after a major loss? We think the answer is YES! and we’re helping to facilitate that belief in others. We achieve that goal through the books we publish, our workshops in numerous cities and through public speaking and media opportunities. We welcome you to become a part of Loving Spirit!